Are you self-conscious and scared to show your teeth? Wouldn’t it be wonderful to actually being complimented by others on how great your teeth look? And wouldn’t it be great to achieve that beautiful smile without having to endure a long period (up to two to three years in some cases) of wearing metal, unsightly braces? Six Month Smiles is a safe, effective and affordable teeth-straightening treatment that will provide you with a beautiful smile in as little as six months. Not only that, but for those six short months you won’t have to suffer the embarrassment of wearing unsightly braces. Instead, the Six Month Smiles treatment utilises a discreet tooth-coloured fixed braced system and state-of-the-art technology that prevents any pain and adjusts the position of the teeth quickly. 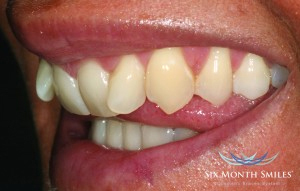 It concentrates purely on the front six to eight teeth that are visible when we smile. Whether your teeth are crowded, crooked, or have spaces between them, the Six Month Smiles programme will enable you to go from uncomfortable and embarrassed when smiling in public to being immensely proud of your straight teeth. 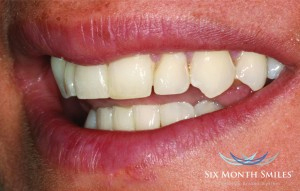 Six Month Smiles is typically less expensive than traditional braces, aligner therapy or veneers. An ideal solution for people who need to straighten their teeth in time for a specific event. We are currently offering this revolutionary teeth-straightening treatment, Six Month Smiles, at an introductory rate of just £1950 per arch instead of £2950! To take advantage of this special offer, please contact Mayfield Dental today on 0208 657 1291 or email us via our contact form. We recommend a consultation to assess whether the treatment is right for you.